As they watch for us to enter there’s an electricity between the two figures eagerly waiting in the sand by the swings as the sea swells quietly in the background. Jess and Joe are ready. They have rehearsed their presentation, have worked hard on what they will show us and “in this moment” they will share a beautiful, soul-soothing story to lift the spirits of anyone who is there. 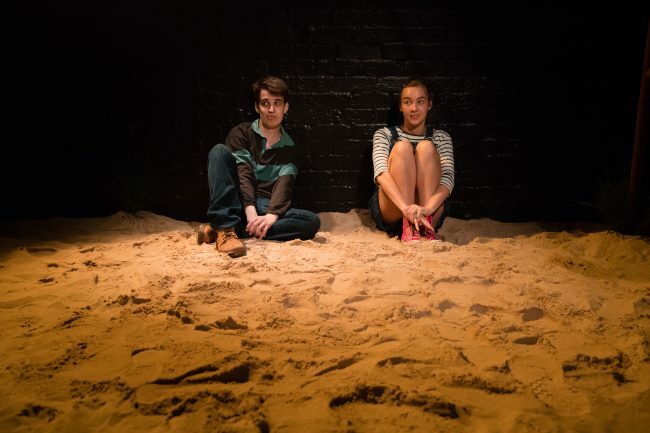 JESS AND JOE FOREVER by Zoe Cooper is a sand gem of a production which shines and glimmers in the tuck of the basement at Belvoir Street Theatre. Jess and Joe have a burning desire to tell their story. Of how they met at approximately 9 ¾ and where their tween love takes them. She has an au pair and a holiday home in Italy, he is a bit of a battler on his Dad’s farm. She is a bit tubby and he is physically shy, too. He is practical and she poetic; she chats and he reacts. For our benefit they will act out how they met, became friends, and the individual tales that happened away from each other that made their time together so important. From that first ginger tiptoe through the sand to find your seat, Nyx Calder and Julia Robertson hover with charismatic impatience to talk with you. As Joe, Calder travels way away from any shy boy trope by a wry and supportive adoration of Jess and a way of taking on a remembrance which allows Joe’s inner light to shine. Robertson’s Jess glimmers with youth and Jess has no qualms about her repetition of heard phrases and her Kardashian aspirational youthful self. Their rapport with each other, in their closeness and shared secret smiles, is absolutely charming. And their winning expression of the narrative is so engaging that the structure of the play rather creeps up on one. They speak directly to the audience with an unsophisticated but replete dialogue. Then elide seamlessly into acting out their experience, including the people around them without twisting their own character, further extending absorption by bumping into each other’s improvisational departures from their agreed and rehearsed scenes. When they act out we observe, sat back in our seats until they speak directly again pulling our attention forward. Director Shaun Rennie has embraced the small area as he gives the characters permission to separate themselves and to hide in corners if required. There are times when the audience must physically move to watch one or the other and choosing a favourite child is surprisingly stressful. Rennie has enabled his cast with all the empathetic power of youthful exuberance then brought the themes home with a gentle insistence that these young people know themselves and each other and love is paramount. They may not be prepared for the consequences of what they act out for us and the rawness of that brings the audience’s sympathies into emotional sync. The production design from Isabel Hudson facilitates that immersion with a simple chalk line which coheres the places of the play. Well used lighting in amber and steel (Benjamin Brockman) and an effect-simple audio design (Ben Pierpoint) are restrained and mood setting. 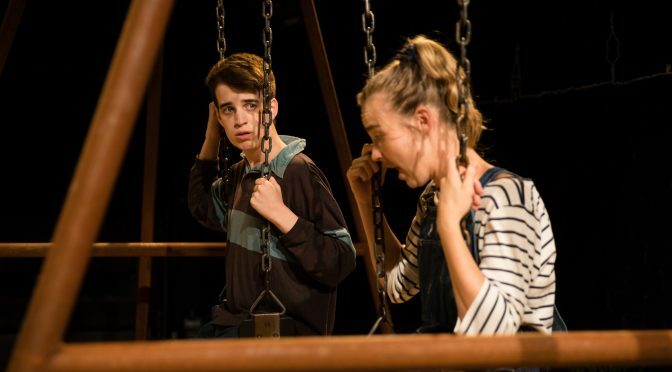 Part of the remarkable 25a season, a Belvoir initiative giving space to independent theatre and which has thrown up nothing other than excellence, Sugary Rum Productions’ JESS AND JOE FOREVER is a show not to be missed. The candour of youth is the guide as sweet and subtle exploration of themes around acceptance, sexuality, love and friendship warm and nurture the watcher. But it needs audiences, please don’t let these wonderful performances play to small houses. Book now, your soul will thank you. JESS AND JOE FOREVER continues at Belvoir Downstairs until March 30 and you can read an interview with the director Shaun Rennie here.